These two machines had just been cleaned and repainted when the photo was taken. The smaller hammer is a late type 50 pound Little Giant with dovetail guides and a rear mounted wood block clutch. 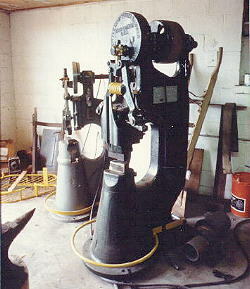 The larger machine is an earlier 100 pound Meyers Brothers with wrap around guide and center cone clutch. Same hammer from above. A little dirtier. 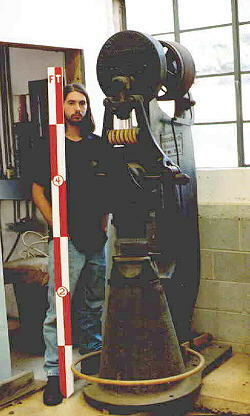 That's my son Patrick holding the scale stick. This hammer came out of a friend's shop. When he purchased it the center clutch was worn out from being hooked up to line shafting that ran constantly. He kept the machine well oiled and produced a ton of work with it. He has moved up to Bradleys and Nazels now, but the old Meyers Brother still has a century or so of life left in it! The only thing I did to this hammer was to clean it, grind and reseat the dies and shim the wrap around guide (needed less than .010" (.0025mm).